You sit down to dinner and your smartphone pings, so you check it. You're making headway on that expense report and your email bleeps, so you open it. You Skype your parents and you open up eBay, Amazon, and Rue La La so you can look for a new coat while they're going on and on about one of your siblings. Scheduling tasks inside other tasks is just what we 21st-century folk do to maximize cramped calendars, right? But in the face of constant multitasking, we tend to lose connection with the present. Mindfulness -- the quality of paying attention to the present moment -- has gained major traction a health benefit. Celebrities from Arianna Huffington to Kobe Bryant and big companies like Google extol the virtues of mindfulness meditation practices and staying connected with technology without letting it take over. Unfortunately, being mindful is seemingly at odds with the way most of us use our smartphones, tablets, and laptops. Here are some strategies for living harmoniously -- and in the present -- when you're constantly surrounded by gadgets. “Technology increases the idea we should multitask,” says Professor Gregg Henriques, a clinical psychologist currently developing a meta-theoretical system for the psychology of well-being and social motivation. After all, the whole point of smartphone apps -- whether they're social, transportation, shopping, or email apps -- is that you can use them no matter where you are and, presumably, no matter what else you're doing. Multitasking has been shown time and time again to decrease efficiency, focus, and clarity of mind. It can even decrease IQ points by reducing the density of the brain's grey matter -- the region that deals with emotional balance and cognition. We may feel as though we're being efficient in a busy world, but taking in so many different streams of information via laptops, tablets, and smartphones overloads the brain. An endless flood of facts means that we have little context for new information and a lower threshold for remembering anything at all. Reclaiming mindfulness: “Increase focus on the task at hand,” Henrique says. Start single-tasking by setting times for particular activities, whether work or pleasure. Old habit: Sitting at work with 15 tabs open; an instant messenger so friends or colleagues can get you quickly; your phone blipping email alerts so you can open them on your laptop. New habit: Shut down that line of open tabs after bookmarking or copying necessary info. And unless there's some pressing need to be contacted, turn off email and app notifications as well as instant messengers. Research now shows that dopamine is linked to the seeking out of gratification -- not just of physical needs but of goals in general, including abstract concepts. In our caveman days, this seeking wasn't rewarded as instantaneously as it is today. When we go seeking in the name of old-school needs -- human connection, knowledge, what our friends are up to -- using new-school ways like texting, Google, and Facebook, we're rewarded in microseconds with messages, search results, and endlessly scrolling news feeds. No wonder we've trained ourselves -- like lab rats finding the quickest way to the cheese -- to instantly respond to incoming alerts rather than maintaining focus on the task at hand. But flitting about from task to task doesn't make us happy. One 2010 study cited by the New York Times used a smartphone app to sample random people's happiness levels. With nearly 250,000 responses from 2,200 people, the study concluded that people who weren't thinking about what they were doing at the present moment tended to be unhappy. Reclaiming mindfulness: Create a wall around the stimulus triggers that yank your attention, says Henriques. Old habit: Reaching for the phone when you get notified of a tweet, like, mention, message, or alert. New habits: Head into the Settings menu on your phone and scroll to Notifications (for both Android and iOS), where you can turn off all notifications; or manually decide the types of notifications for each app. Turn on Do Not Disturb (iOS), a handy setting for silencing alerts while allowing certain contacts to get through (there are similar apps for Android). Outside work hours, set discreet email and message tones such as simple click sounds. A study last year by psychologist Linda A. Henkel guided participants through an art museum, asking them to photograph some pieces but only observe others. The study found that if participants took a photograph of an object, as a whole, they tended to remember fewer details and fewer objects than if they'd been asked to only observe. In an interview with NPR, Henkel said, “Anytime we kind of count on these external memory devices, we're taking away from the kind of mental cognitive processing that might help us actually remember that stuff on our own." Reclaiming mindfulness: Pay attention to the present moment rather than proving it happened by posting it online. Old habit: Posting an Instagram picture of the thing you're doing right as you're doing it. New habit: Instead of interrupting a moment to get a photo (say, of that seared pork belly your dinner companion is waiting to eat), pause a second, snap the picture, then post it at your leisure as a #latergram. In psychological terms, mindfulness is a cohesion between the three parts of human consciousness: how we feel right now, who we want to be as a person, and how we want other people to see us. In a time where there are unprecedented, minute demands for our attention -- Candy Crush Saga requests, urgent emails, and unread Facebook likes -- our minds begin to get hooked on the rush of these here-and-now tasks instead of maintaining focus on longer-term tasks whose achievement would, according to that theory of mental harmony, support the larger narrative of who we want to be. “The constant pinging for attention results in a change in how our [mind] mechanism works,” Henrieques says. Having so many opportunities when we go online for a dopamine reward primes us to be chronically active, he says, seeking out quick-fix rewards through tiny tasks like scrolling through BuzzFeed instead of, for example, just taking some downtime. Reclaiming mindfulness: “Get practice with recognizing when you're in a mindful versus not-mindful state,” Henriques says. Check how aware you are of your surroundings and of your body and whether you're trying to respond to dozens of pings for attention. Old habit: Browsing Twitter or Facebook because you're bored or blocked on a work project. New habit: “Slow down and ask yourself, 'Why am I doing this? '” suggests Henriques, and observe whether it fits into your overarching goals or if it's a compulsive reaction to, say, feelings of stress or negativity. 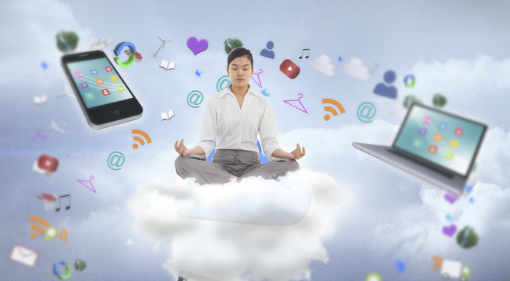 With mindfulness spiking as a Google search query, there's no shortage of apps that want to help us get mindful, meditate, and even dampen our attachment to the very devices we need to use to access these apps. Moment is an iOS app that tracks how much you use your iPhone or iPad each day. It counts screen time only, so if the screen is off -- say, if you're listening to music or on a long call -- that doesn't count. You can set daily limits for notifications or even a forced shutdown when you're over the limit. For the mindfulness despot in you, there's Moment Family, which lets you monitor the screen time of family members who've downloaded the app and enforce daily limits -- perhaps to finally have that phone-free dinner you've been dreaming of. BreakFree is a similar app for Android that records time spent on your phone, tracks which apps you spend it on, gives you an addiction score, and offers options to turn off all app notifications and reject calls. Over at Mindful.org, recommendations for good meditation apps out of 45 tested offerings are Headspace (iOS/Android: free 10-day trial; from $7.99/month), which gives you 10-minute meditation sessions guided by co-founder Andy Puddicombe; The Mindfulness App (iOS/Android: $1.99), which provides guided meditation sessions of three, five, 15 and 30 minutes along with silent sessions and the ability to record progress; and Mindfulness Meditation (iOS/Android/PC/Mac: $17/year), with six guided practices of different lengths narrated by the author of Meditation for Dummies. Then there are desktop programs for curbing those stimulus triggers: Anti-Social (PC/Mac: free trial, $15 purchase), which automatically blocks all social network sites for a chosen length of time. You can also customize the blacklist with more attention-grabbing sites (in our case, shopping sites featured heavily). If any internet is bad internet while trying to work, check out Freedom by the same company that makes Anti-Social (PC/Mac/Android: $10; $20 for both programs), which blocks all internet access for up to eight hours. Mac users can also try free counterpart Self Control. What do you think? Does simply walling off notifications and temptations help, or do you bounce back with a vengeance once your access is turned back on?